Current Status: formed by a merger of Monitor, Isaac Parker and Waltham Lodges, 06/10/1988. Victory Lodge merged into this lodge, 06/02/2003. 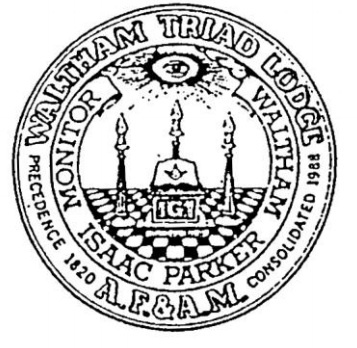 The official merger of Isaac Parker Lodge of Belmont, Monitor Lodge of Waltham that had been meeting in Belmont, and Waltham Lodge that had been meeting in Watertown, was consummated June 10 in the Newtonville Masonic Temple. Grand Master Albert T. Ames and Grand Lodge's officers officiated. The Grand Master then installed the new officers of the new Waltham Triad Lodge. 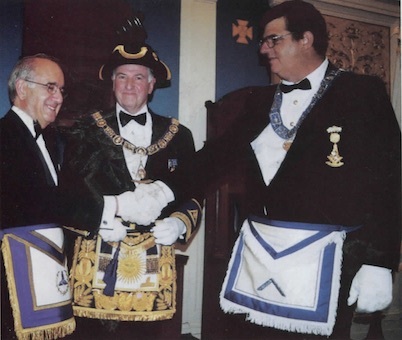 Grand Lodge approved the merger at the September 1987 quarterly communication. Monitor Lodge dates back to 1820, Isaac Parker to 1867, and Waltham Lodge to 1928. The new Lodge will be in the Brighton Fifth District. The merger of Victory Lodge and Waltham Triad Lodge took place on Monday, June 2 in Newtonville. The Charter of Victory Lodge was turned in, and the combined Lodge will continue as Waltham Triad Lodge, which has a precedence of 1820. The Lodge room was filled to overflowing with more than 150 members and guests for the merger ceremony, and the social hour and dinner which followed. Pictured above with Grand Master Donald G. Hicks, Jr. are (L) R. W. Shant L. Chebookjian, Master of Victory, and (R) Wor. Norman P. Poirier. Master of Waltham Triad.